Job seekers can send in their Allstate application for a chance to work for the leading insurance agency in the United States. Founded back in 1931, the company currently employs over 40,000 people and continues to expand. Its impressive development has made it one of the Fortune 500 companies. Monday – Friday: 8:00 A.M. – 5:00 A.M. The Allstate customer service office is open 24/7 and can be reached at 1-800-ALLSTATE (1-800-255-7828). Customers can find complete information on the Allstate Contact page. According to the Allstate hiring policy, all candidates for employment are required to be at least 18 years old to be considered eligible. All younger job seekers will be automatically excluded from the application process. Job seekers are required to go to the Allstate job application portal to find the complete list of available positions at the company. They will be able to conduct a personalized job search by selecting their desired career area and their current location. The portal will then present them with all the Allstate job openings that are in line with their search criteria so that they can find the positions which are best-suited for their needs. 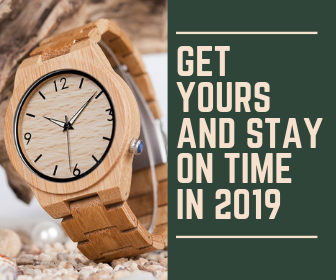 When they find a career that they want to be considered for, they can click on the Apply Now button to begin filling out their online jobs and employment forms. This is the data-fill tool provide by the Allstate application portal. 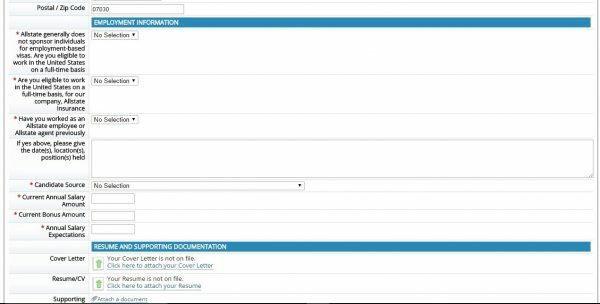 Candidates can upload their resumes at this point to have the portal automatically transfer the relevant information in their CVs to the appropriate sections of the form. This will save them quite a bit of time because the portal will populate a great part of the form automatically. For this section of the Allstate application profile, candidates can attach their resumes and cover letters to their profiles. Please note that this step is optional. For this section of the Allstate application profile, candidates are required to provide the main details about their work experience. They can include information about several jobs that they consider to be relevant to their hiring process. This section of the Allstate application profile requires candidates to provide information about their academic background by including the most important programs they have attended throughout their formation. For the Allstate application candidate profile, job seekers must provide information about their professional and academic experience. For this section of the Allstate application profile, candidates can add specific professional skills that they have acquired throughout their professional experience. They will be able to choose the skill area, the primary skill that they have, and their level of proficiency in that skill. Please note that they are allowed to include multiple entries to this section. For this section of the Allstate application profile, candidates are may add information about any foreign languages that they speak. They will be asked to list the proficiency level for each language they include. For this section of the Allstate application profile, candidates can mention any licenses or certificates that they have acquired throughout their professional experience. They will have to mention the industry/ specialization, the type of license/certificate that they have, the issuing institution, as well as the expiry date. For this section of the Allstate application profile, candidates can add any additional documents to their resumes that they consider to be relevant to their hiring process. For this section of the Allstate application profile, candidates are required to provide their complete contact details to the form. This section of the Allstate job application form includes the candidates’ contact details and it will feature the information provided to the Candidate Profile. This section of the Allstate job application form includes a series of pre-employment questions. These are meant to verify that the candidates meet the company’s main employment eligibility criteria. It also requires candidates to mention their current salary and bonus amount, as well as their annual salary expectations. For this section of the Allstate application form, candidates will have to answer the pre-employment questions. This section of the Allstate job application form allows candidates to provide their resumes, as well as any additional documents they consider to be relevant. If they have already attached these files to the Candidate Profile, this section will also be completed. 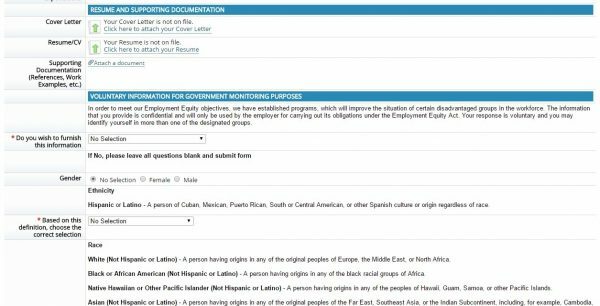 This section of the Allstate job application form requires candidates to disclose information about their race, gender, and ethnicity, as well as their veteran status. Please note that the portal requires candidates to choose one of the provided answers to this questionnaire. However, if they do not wish to share this type of information, they can choose the “Not willing to disclose at this time” answer to be able to submit their forms. For this section of the Allstate application form, candidates must answer the company’s EEO questions. For this section of the Allstate job application form, candidates are required to read the Fair Credit Reporting Act Disclosure. Candidates are required to provide their electronic signatures as proof that they agree to the terms of the agreement. For this section of the Allstate application form, candidates must read the Fair Credit Reporting Act Disclosure. Before they can submit their Allstate applications, candidates must answer a few employment specific questions. After this, their forms will be sent to the Human Resources department for the formal analysis. For this section of the Allstate application form, candidates must answer a few employment-specific questions. The updated list of Allstate job openings is available on the company’s careers portal. Candidates can choose their preferred career area and their location to find the positions that are best suited for them. Customer Service representatives interact with Allstate’s customers and solve their problems one by one. They will address them in a respectful and calm manner at all times and they will do their best to find the optimum solutions to their issues. The Allstate salaries for customer services representatives range between $24,000 per year and $41,000 per year, for experienced employees. Aside from the base salary, employees will also be provided with a bonus pack meant to repay their dedication to the company. Job seekers will find the latest Allstate job openings in management on the company’s careers portal. They can also join the company’s talent network and they will be notified as soon as a new position that they would be interested in comes up on the portal. Allstate benefits packs provide employees with a comprehensive offer so that they can feel safe both at work and outside it. 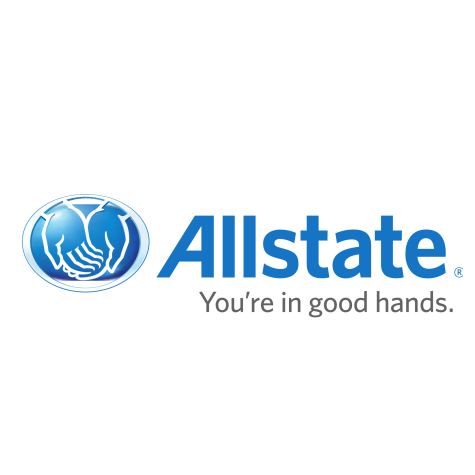 Allstate is the leading insurance agency in the United States. As such, their employees have access to some of the best benefits packs out there because are a representation of the company’s reputation. The Allstate application form is quite easy to fill out. Candidates should follow the instructions provided for them in the form to make sure that they include all the required information. They should try to fill out as many sections of the form as possible, including those that are not mandatory. We also recommend that they attach their resumes and cover letters to their Allstate applications. This will provide the Allstate hiring specialists with detailed information about their academic and professional experience. The Allstate application form does not feature a section where candidates can review their employment forms before submitting them to the HR specialists. We strongly advise them to proofread their forms as they fill them out to make sure that there are no spelling and grammar mistakes. The Allstate hiring specialists will analyze the application forms sent in by the job seekers and they will select the best-suited candidates for employment. Thy will then be called in for interviews with the HR specialists, the hiring managers, and the department managers, if necessary. Depending on the career level sought by the candidates, they may be asked to come in for one to four interviews before they receive their final answer. We strongly advise interview candidates to read about the development of the company and the major achievements it has acquired over the years, such as its place on the Fortune 500 list. They should also get familiar with the types of insurance coverage and services that Allstate offers its clients. They should be prepared to receive questions about the company during the interview. Providing accurate answers to these questions will help them distinguish themselves from their contenders. They can use the company’s official website, www.allstate.com, as their main research source. We also advise candidates to go through the sample questions we have provided and practice their interview answers. While the Allstate employment specialists may ask them different questions during the job meeting, the practice can actually improve their performance. Why have you chosen to apply for Allstate employment? What do you think makes you a solid candidate for the Allstate career you have chosen? What are your greatest strengths? What about your weaknesses? Could you please tell me about a time when you have had a major change at your job? How did you cope with it? Could you please tell me about a time when you felt you have neglected a customer? What actions did you take to rectify the situation? In your opinion, what is the most important phase of project planning? What can you tell me about yourself that is not included in your Allstate application?